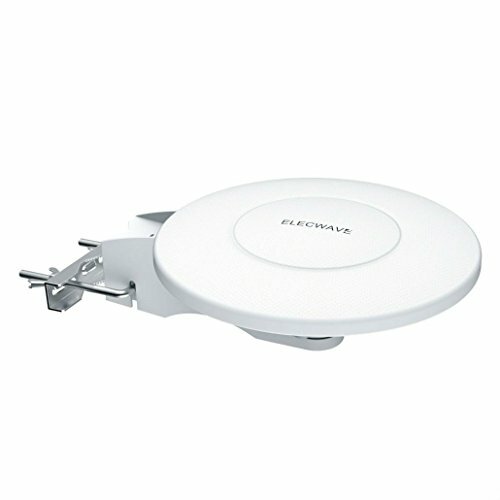 ❀ Product Description Elechomes Indoor & Outdoor Amplifier Antenna Were you bored of paying relatively large sum of money for TV programs and easy damaged outdoor large antennas? This Elechomes HG-3926 indoor/outdoor digital antenna which can be installed or placed flexibly with 12m coaxial cable is one of the most powerful antennas to help gaining free signals within up to 100-120 miles range for your favorite TV programs. Operational Guide 1) Check whether the antenna is correctly connected to your HDTV or 3rd party HD receiver. 2) Scan free channels to watch clear programs. If needed, please reposition the antenna to get better signals. 3) Antenna signal strength can vary depending on distance from the tower, terrain, and weather. If needed, reposition the antenna in a different location, such as higher on a wall or closer to a window, and face it in the direction of the broadcast tower. 4) Always re-scan for channels after moving the antenna. If you have any questions about this product by Unbranded*, contact us by completing and submitting the form below. If you are looking for a specif part number, please include it with your message.